I don’t know why this idea never caught on sooner. The sting of the bubbles, and a versatile palate of vibrant fruity flavours.. one can’t really go wrong if one finds the right degustation menu to go with it, I expect. 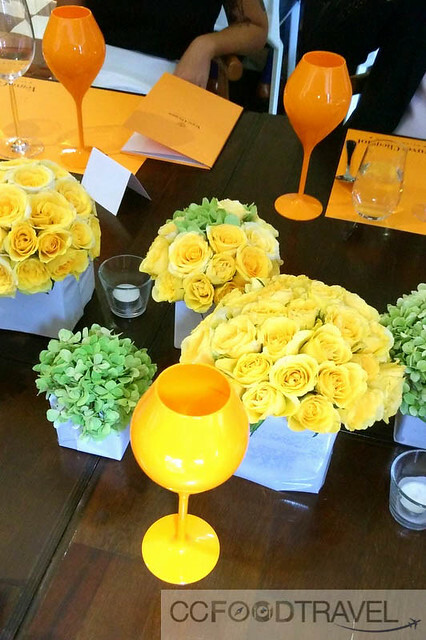 Which brings us to our lunch with visiting Winemaker from the House of Veuve Clicquot France, Pierre Casenave. We entered Brasserie Enfin and noticed how thematically well decorated it was. 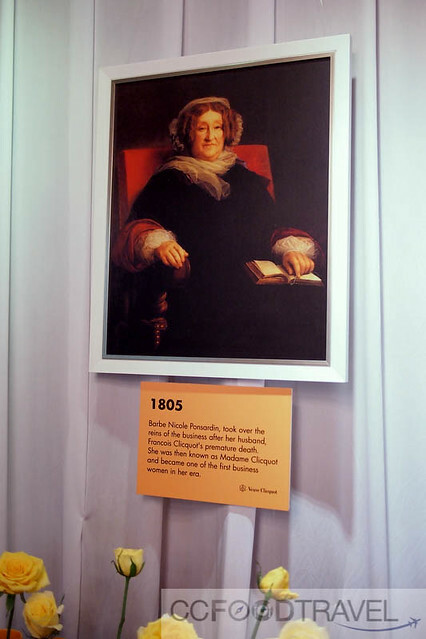 Madame Clicquot, known as the “Grand Dame of Champagne”, was a French businesswoman who took on her husband’s wine business when widowed at 27. 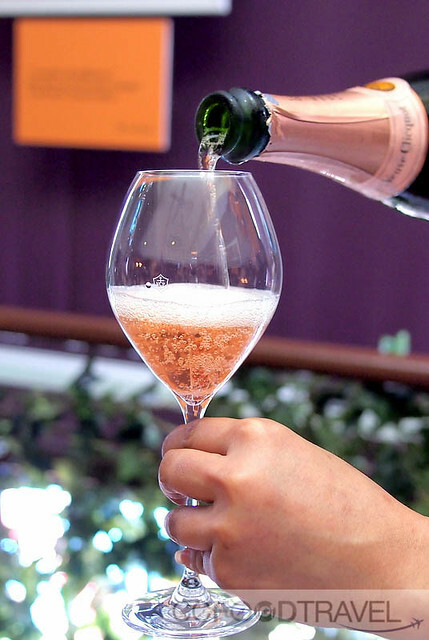 Under her ownership, and her skill with wine, the company developed early champagne using a novel technique. 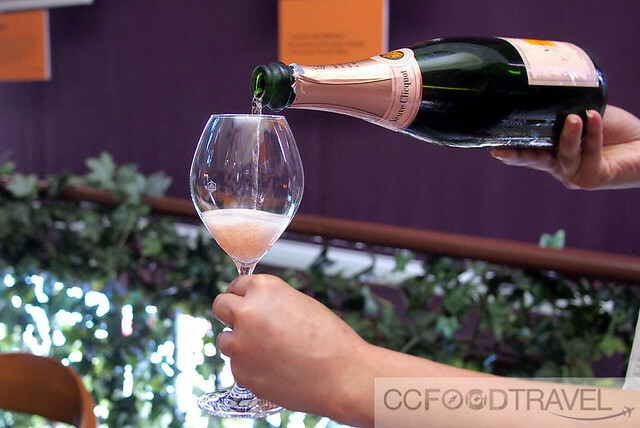 The brand and company of Veuve Clicquot Ponsardin still bears her name. 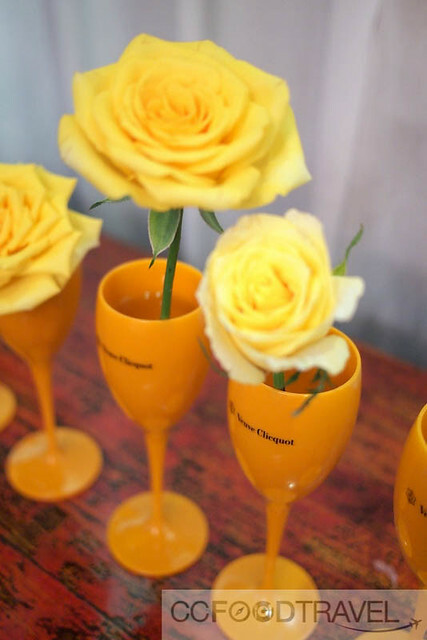 Welcome drinks of Veuve Clicquot Yellow Label Brut greeted us at the door. 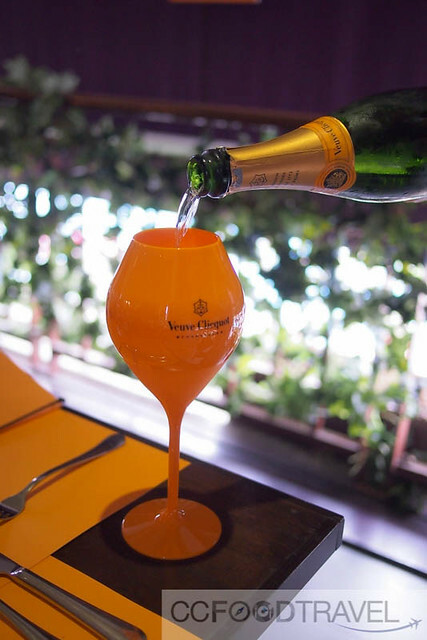 Later, there would also be the fruity pink bubbly, Veuve Clicquot Rosé and the legendary, full bodied Veuve Clicquot La Grande Dame 2004 to reckon with, paired with our 4-course menu. 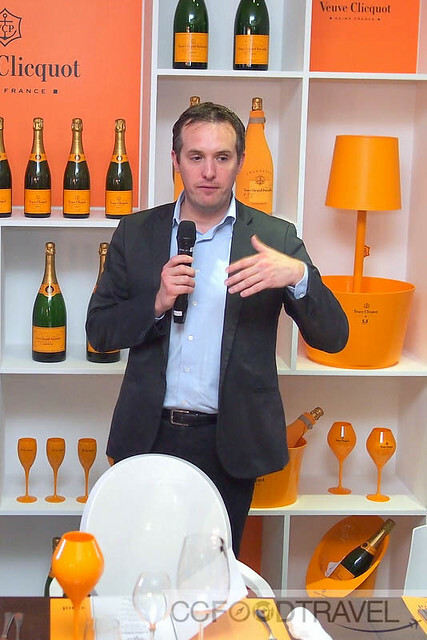 The event then formally began as Pierre Casenave raised a toast and talked us through the heritage of the House of Veuve Clicquot, its vineyards and winemaking process, paired together with the specially prepared menu by Brasserie Enfin’s executive chef & owner, Chef James Won. This was an interesting course. 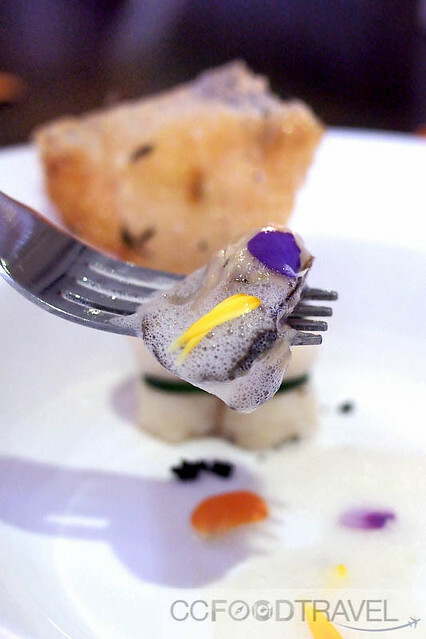 Scallop torchon are made by removing the square muscle on the side of the scallop, salting it, blending till creamy with egg white, cream, adding chopped herbs, seasoned, then Sous Vide until the torchon is firm. 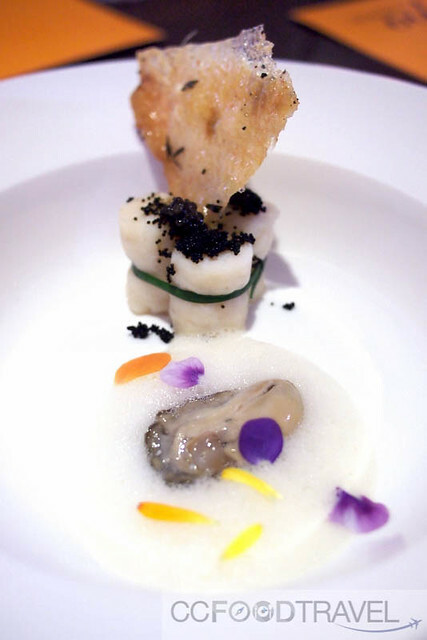 Actually I would have preferred my scallops straight up, rather than the processed torchon, which rather tasted like a high-class version of a fish or scallop ball, but then again, the coating of caviar and the wafer of deep-fried chicken skin saved the day. The oyster in oyster emulsion was sublime. 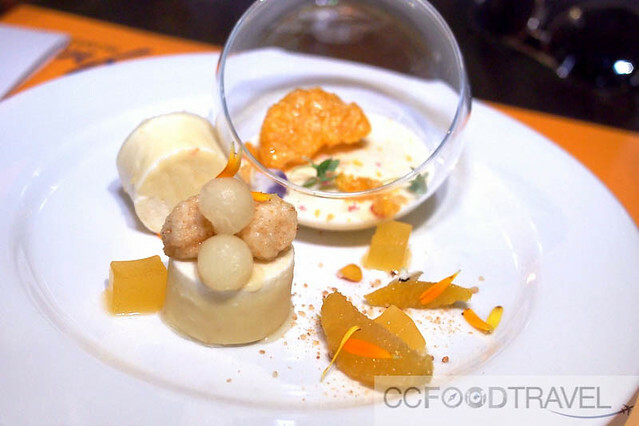 This first entrée, paired together with the Veuve Clicquot Yellow Label Brut famously. No complaints here. 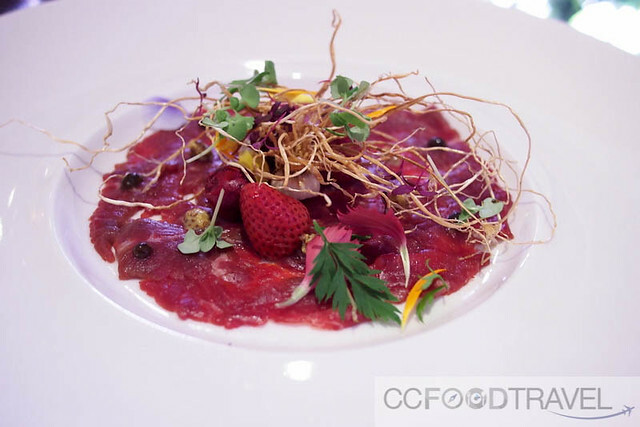 The second entrée, grain fed lamb eye of short loin carpaccio with confit of strawberries, puff cherry, and champagne mustard was served next. 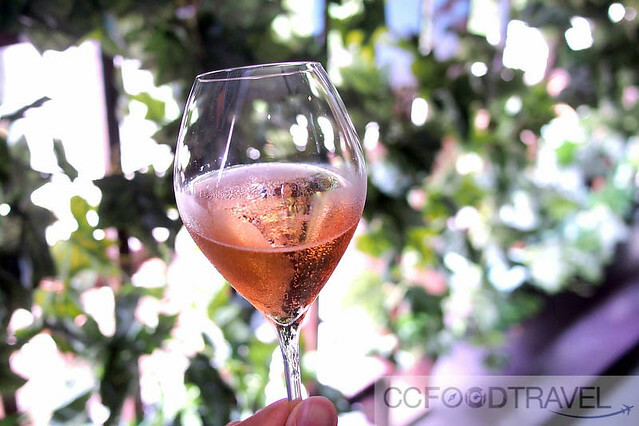 This was a delightfully luscious, rosé that had a luminous color with attractive pink glints. On the nose was raspberry, strawberry, but as you drank it, the wine worked its magic – it bloomed and blossomed and engulfed the grain fed lamb carpaccio in fruity flavour, and heightened the aromas of the confit of strawberries and puff cherry. Superb. Check out the fat in the belly.. Whoa! 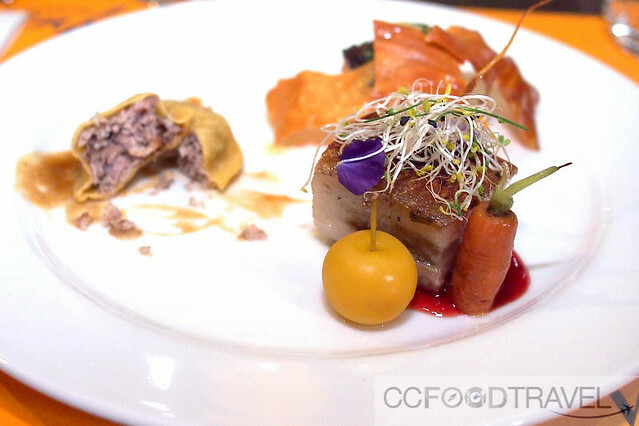 The main course for the afternoon comprised of a serving of three cuts of pork; pork shoulder, pork belly and pork ribs, paired with the Veuve Clicquot La Grande Dame 2004. 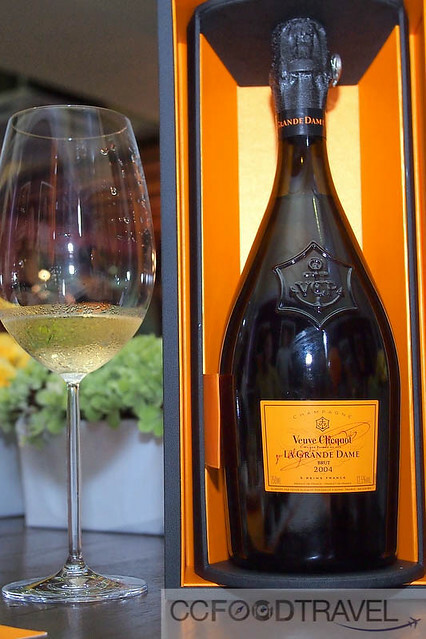 This turned out to be a great wine which paid homage to the “grande dame de la Champagne,” Madame Clicquot. The Cuvee itself possessed finesse, a fine complex fragrance and was mellow in the mouth, with considerable substance and structure. 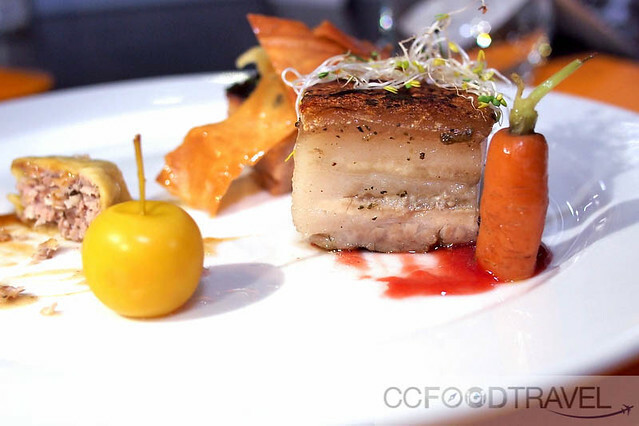 When paired with the pork trifecta, it exhibited a remarkable balance and harmonious finish, and a unique aromatic aftertaste. I did find the pork shoulder and rib too dry and the pork belly too fatty, but all these shortcomings were forgiven, and forgotten, thanks to the amazing cuvee! 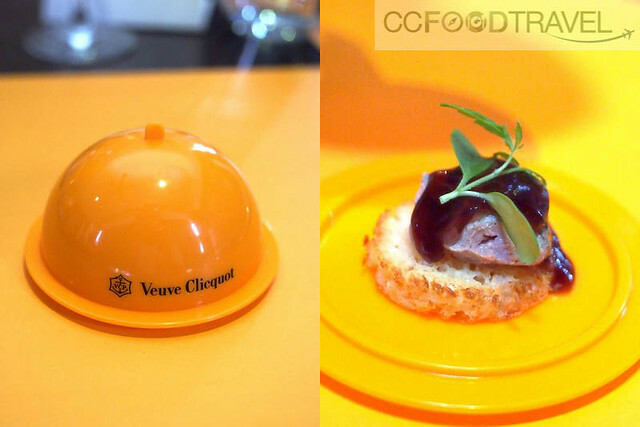 Dessert was then served – a sweet pairing of a citrus gelée and cloud served with the Veuve Clicquot Yellow Label Brut. I found the dessert unremarkable, but the pairing worked well enough with this one. 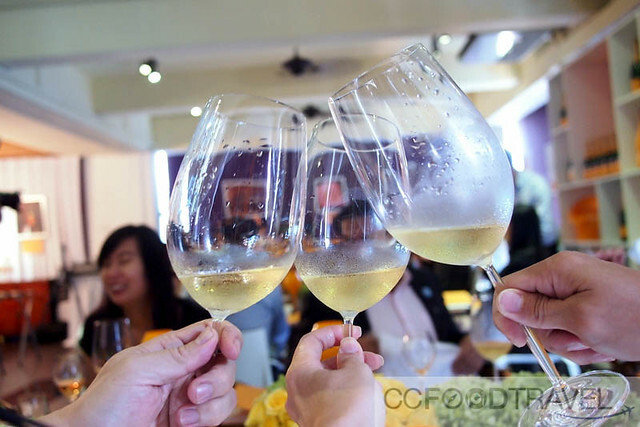 Well-knit and balanced, with vibrant acidity, the cuvee did manage to lift the spirits of an otherwise two-dimensional tasting dessert. Pierre Casenave.. a rather cool guy. 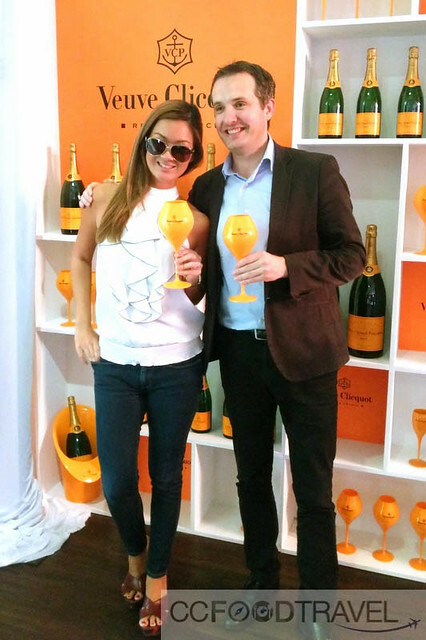 He said something about how good champagne isn’t only a good pairing for any food adventure, it’s also a bond which unites daring, confident and sophisticated individuals just like the woman behind the fine champagne, Madame Clicquot, and I couldn’t agree more. A brilliant afternoon.. one where La Grande Dame stole the show.. oh yes she did, indeed.